The 15th of October (15O) was the first coordinated global response to the crisis, signifying the emergence of a new international movement. Initially inspired by revolutions in North Africa, through emulation and imitation, protests began in the periphery of Europe. The Mediterranean world thus found itself situated in the epicenter of a new wave of social protest, at a moment when we entered in a second phase of the crisis whose focal point is the euro zone. Little by little, the rebellion of the indignant has come to take a veritable international dimension, beyond actions taken in sympathy and solidarity. First arose the Greek protest movement, setting a precedent for the Spanish one and the revolts in the Arab world, which the symbols and methods of 15M integrated while inserting its own logic into the nascent international dynamic. Then came an undeniable beginning of protest in the United States, though still in an early stage — the most relevant variable of the moment, whose destiny will be crucial for the global development of the movement. 15O was the day of the most important global protest since the great global mobilization of 15 February 2003 against the Iraq war. Though more modest in size, it nonetheless expressed a deeper social dimension than the historic day of action against the war. That day in 2003 marked simultaneously the crucial moment and the end point of the ascendant phase of the cycle of international anti-globalization protests that were born in November 1999 during the World Trade Organization (WTO) summit in Seattle, having been in gestation since the Zapatista uprising in January 1994. “There may still be two superpowers on the planet: the United States and world public opinion,” said the New York Times after 15F. After that, however, international coordination of protests languished, and the instruments created by the anti-globalization movement, like the World Social Forum, lost strength, central focus, and concrete utility. The current context is very different from the one that witnessed the emergence of the anti-globalization movement at the end of the last century. The ongoing cycle is developing in the middle of a systemic crisis of historic proportions, so the depth of the social movement underway and of its social base of support is undoubtedly greater. The vitality of 15O in Spain again surprised all and sundry, thus refuting certain impressionistic analyses of the crisis of the 15M movement that had proliferated in the preceding weeks. What we are seeing is not an episodic and temporary phenomenon, but the beginning of a new protest wave of the deep swelling sea that is not going to evaporate. The very nature of global capitalism and the magnitude of the current crisis drive the internationalization of social protest. The slogan “United for Global Change” sums up well this new “internationalism of indignation” which emanates form 15O, whose challenge is how to unleash a global movement that points to another path to exit the present civilizational crisis. Unlike in the era of anti-globalization protests, the interrelation between distinct spatial levels of action — local, national, and global — is now much more solid. The link between local and global, concrete and general, is very much direct and obvious. Echoing the bottom-up mobilizations in the Arab world, 15M protests exploded in Spain, with demonstrations in many cities. They rapidly spread geographically, across countless towns as well as neighborhoods of major cities. Neighborhood assemblies were born or became stronger, feeling part of a general movement. Their activity localizes the general demands and objectives of the movement and generalizes concrete particular problems. There is a path of comings and goings between neighborhoods and 15O. Since its eruption, the movement has brought about in our country a powerful process of repoliticization of society and reawakening of interest in collective affairs. The tide of indignation has yet to rise to the level of strength sufficient to provoke a change of course and paradigm, but it certainly presents an unprecedented challenge to neoliberalism whose legitimacy has been battered and to the attempts to socialize the cost of the crisis, which it seemed impossible to fight back against even just a few months ago. Above all, the path from 15M to 15O has transmitted a message of hope for the collective capacity to change the dismal course of humanity. Not surprisingly, indignation, as philosopher Daniel Bensaïd said, is precisely “the opposite of habit and resignation”. *Josep Maria Antentas is a professor of sociology at the Autonomous University of Barcelona. Esther Vivas is a member of the Centre for Studies on Social Movements (CEMS) at Universitat Pompeu Fabra. 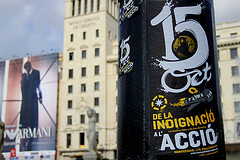 The original article “15O: indignación global” was published on Vivas’ Web site on 22 October 2011.